The Pelican 1720 Rifle Case is another great waterproof case from Pelican designed for protecting and transporting long equipment such as rifles and shotguns. Pelican Rifle Cases are virtually unbreakable and totally guaranteed to be airtight and crush proof. The 1/4" o-ring seal includes a pressure release valve for adjusting atmospheric pressure changes. The Pelican 1720 has an optional low density foam that can be shaped to fit your firearms, extra magazines, and any other accessories (Please note it is a solid foam that you can trace your item and cut for an exact fit). 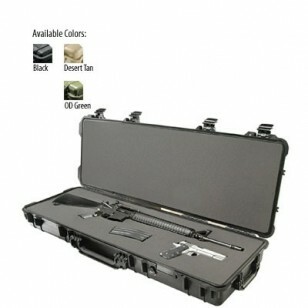 Pelican Rifle Cases are the ideal way to protect your firearms. Available with or without solid foam. Interior Dimensions: 42.00" x 13.50" x 5.25"